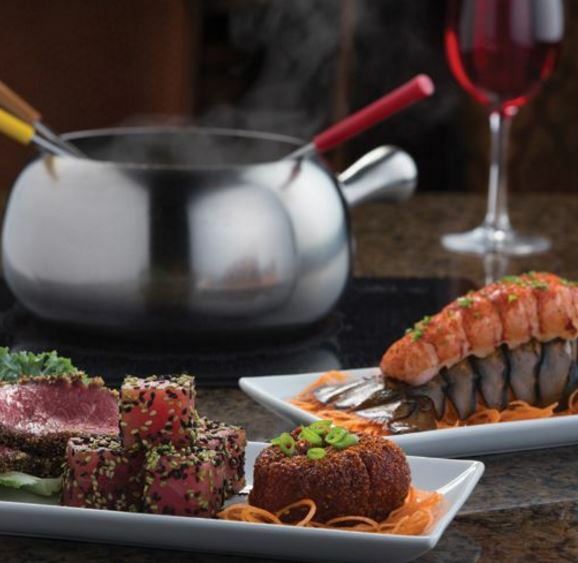 A date night at The Melting Pot is perfect for first dates or for longtime couples. 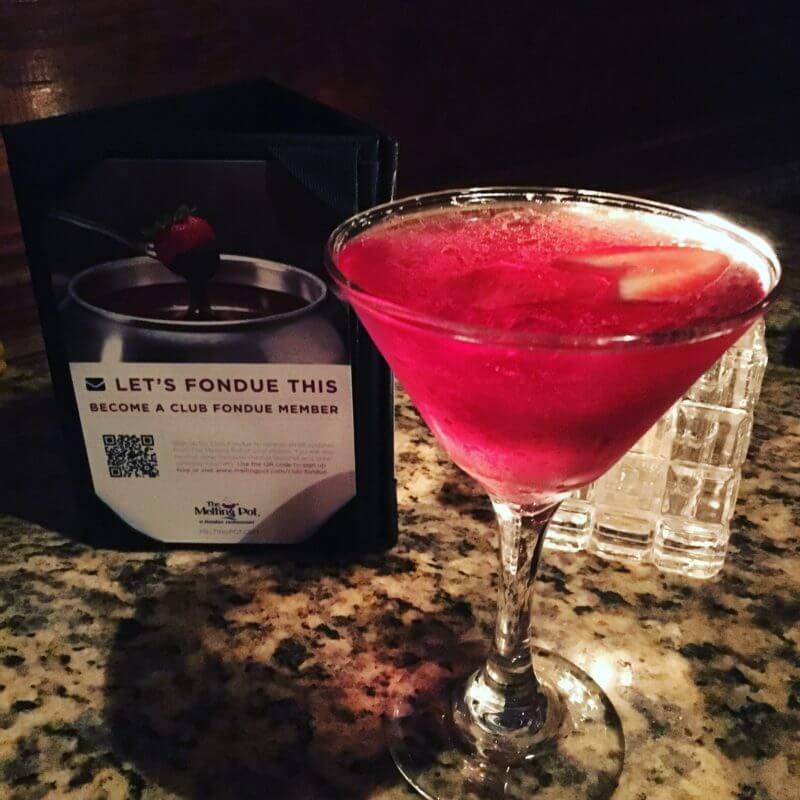 Be prepared for a fun, interactive fondue dining experience. This was our first time here, and it did not disappoint. The menu offers a few options, so you are free to customize however you like. I suggest you indulge in the 4-Course Experience! 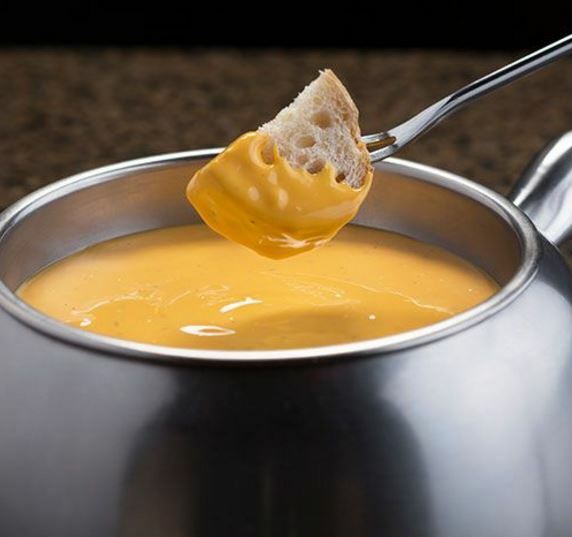 You start off by selecting your favorite cheese fondue, salad, entrée and chocolate. After that, you can choose one of the four cooking styles and sauces to enhance the flavor in every bite. They have a full bar, including an extensive wine menu. You can pick a 5- or 8-ounce glass, or buy the whole bottle. I started off with the Love Martini, and it was love at first sip! Delicious Malibu Rum, peach schnapps, cranberry juice and fresh heart-shaped strawberries. The first course is the cheese fondue. We chose the Wisconsin Cheddar (aged cheddar, Emmenthaler. Melted with Lager beer, garlic, spices). The fondue came with two kinds of bread, soft pretzel bites, Granny Smith apples and veggies. It was amazing! Our server, Jarrad, made the fondue at our table, and he made it such a pleasurable experience for us first timers. He explained the cooking styles and led us through each course. The second course is the salad. We both chose The Melting Pot House Salad (romaine & iceberg lettuce, cheddar cheese, tomatoes, croutons and sliced egg). All the dressings are house made, and the peppercorn ranch was the best I have ever had! The next course is the meat or seafood entrée you chose. I ordered the Surf and Turf (cold water lobster tail, premium filet mignon with wild mushroom sacchetti). I also enjoyed a wonderful glass of Piesporter Riesling with my entrée. Scott went with The Classic (certified Angus Beef sirloin, Memphis-style dry rub pork, pacific white shrimp, herb-crusted chicken breast and teriyaki-marinated sirloin). The meats, lobster and shrimp were fresh and cut skewer size, so you can easily put them on your skewer to cook. We had the most fun with this part of the dinner! You cook your meat and seafood entrée on your own colored skewers in a pot of boiling broth in the middle of the table. You can pick from four styles of broth. We chose the Coq Au Vin (the classic French tradition of Burgundy wine infused with fresh herbs, spices and mushrooms). We laughed, joked, cooked, experimented and tasted each other’s selections. We became self-proclaimed fondue-cooking experts! Jarrad brought many delicious sauces to try with each of the different meat and seafood selections. The last course was dessert. We chose the milk chocolate and peanut butter option. Jarrad also brought me the dark chocolate on the side. Dipping treats included strawberries, bananas, Rice Krispies treats, brownies, pound cakes, pineapples and marshmallows. The milk chocolate and peanut butter was our favorite! The dark chocolate also was good on all the fruits. You always can ask for extra dippers if you want them for both the cheese and the dessert. The dessert was our favorite course! When dining here it truly is an experience. Be prepared to stay for two to two-and-a-half hours. Take your time and enjoy a very romantic dinner. It is an intimate, romantic experience — cooking with your partner by candlelight, enjoying conversation, laughter and coming together over artisan cheeses, fresh salads, savory entrees and delicious desserts. 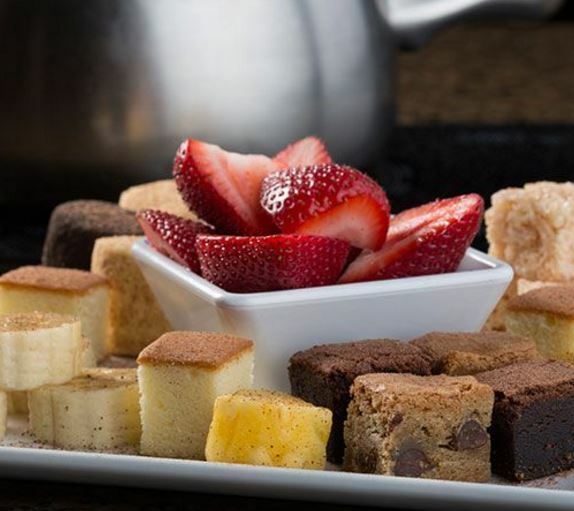 No matter how many courses you choose, The Melting Pot provides an unforgettable, interactive dining experience.